The newport beach hotel and suites formerly The inn at newport beach is newports beachfront hotel and overlooks newport beach cliff walk and the famous mansions beyond. Recently completing a multi-million dollar renovation the hotel offers 28 renovated guest rooms and 14 suites in the original historic hotel and 26 suites in a new addition adjacent to the original hotel. The 26-suite addition showcases spectacular views of newport beach and newport pond with floor-to-ceiling windows 37-inch flat screen lcd tv full kitchen washer and dryer and granite and marble bathrooms with jacuzzi tubs. 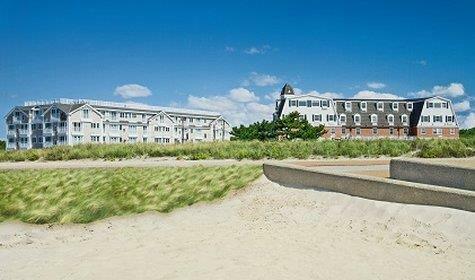 Guest rooms and suites are fully renovated retaining its historic new england seaside charm. Amenities include a complimentary business center free wireless internet guest laundry indoor pool jacuzzi fitness center spa facilities and rooftop hot tub and fire pit. The ocean bar and grille provides an ideal setting for cocktails and light fare in a casual ambiance. View the bars 50-inch flat panel television or take in the majestic sunsets. Other local restaurants are steps away. Situated along the sandy beach of one of the most famous resorts in the world the Newport Beach Hotel and Suites proudly stands as the freshest face of Newport Rhode Island. Located on the corner of Memorial Boulevard and Wave Avenue the Newport Beach hotel and Suites has Newports first beach on one side with its crashing waves and sandy shores and the serene Newport Pond on the other.